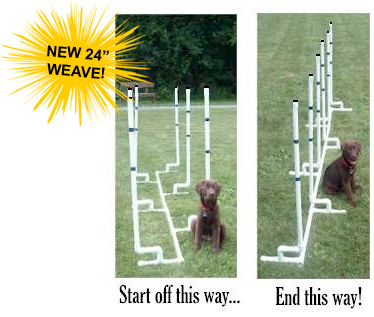 One of the newest methods of training the dog agility weave poles that is gaining in popularity is the "channel method", in which two parallel rows of weave poles are put side by side, but offset in such a way that the dog has a center "channel" to run down. At first your dog is not weaving (just getting a treat by running through to the other end). But by slowly bringing the poles closer together, inch-by-inch, your dog will begin to weave without him even knowing it! When all poles are eventually brought fully together it is a straight line of poles, and if you are patient and don't rush the channel process, your dog will come to "understand" weaving and be less apt to miss poles in the future! When you order the Channel Weaves, you will get free tape for decorating the poles any way you'd like, easy-to-use assembly instructions, and training tips. You also (for no additional charge) get the extra pieces needed to connect two sets together.